Elk Mountain Tents are engineered for easy setup and assembly. We sell complete frames for our tents, but you can cut your own poles to lower costs. We sell frames that come with pole clips and bags, but you can make your own out of 3/4″ EMT (electrical) conduit. 3/4″ EMT has an outside diameter of .922″. EMT can be purchased at most hardware stores and comes in 10 foot sections. The angle pieces have an inside diameter of 1″. Floor pieces (front & back poles and 6 Common Poles) are not necessary but help keep the legs square and help when placing a tarp for the floor. The cost of making poles will be around $80 to $120. Our frames come with pole clips so they can easily snap into the angles. 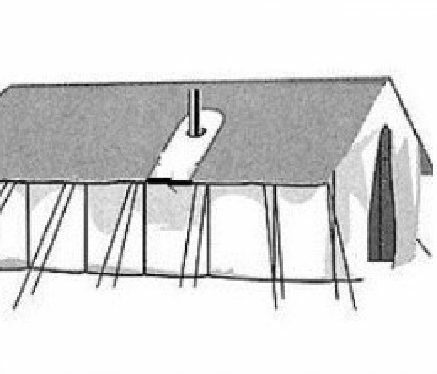 Below is an example of a 4 rafter system for our 13×16 and our 13×20 canvas tents. The 13×13 tent is a 3 rafter system. We supply all of these angle pieces with the tent. 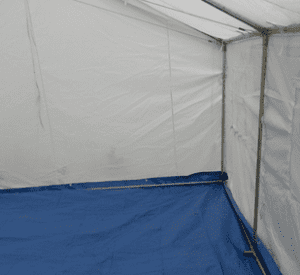 Our 4 rafter wall tents come with the twelve 1″ angle pieces seen below. In addition to the angle pieces, the tent includes a wire truss system unique to our canvas tents. For ease of installation, the ridge angle pieces each come with a carabiner that attaches to the wire truss system. 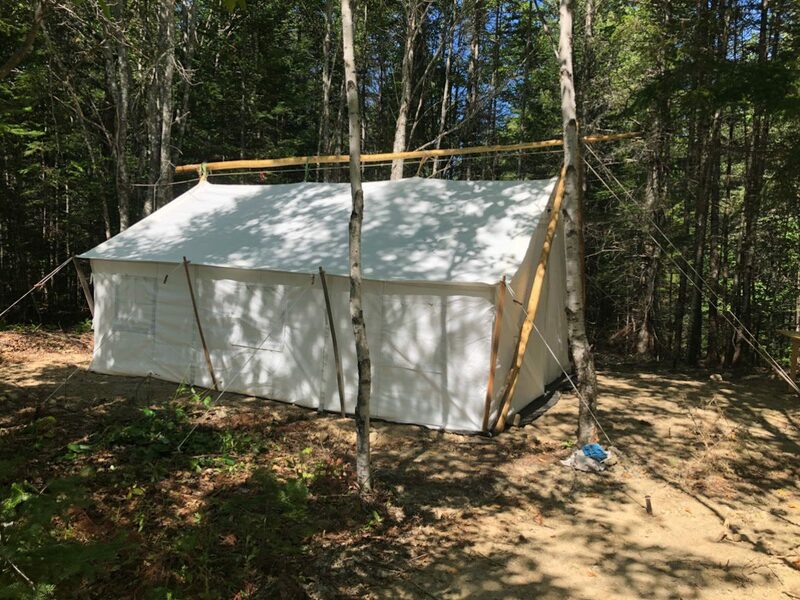 If you plan on having your canvas tent handle snow loads, you will needed additional trusses or supply vertical support. Additional angle pieces are for sale. The 13×16 and 13×20 wall tent come with an additional 8 angle pieces to build a base. The 13×13 wall tent comes with 6 pieces. The base is not necessary but helps keep the tent square and can provide you an object to tuck the ground cloth under. Having these bottom poles is also extremely helpful when placing a tarp down for a floor. Simply tuck the tarp under the poles and up between the wall and the wall poles. Tuck the ground cloth under tarp and base poles, making a nice tight floor. We know of no other company with canvas tents for sale that provides these additional pieces. 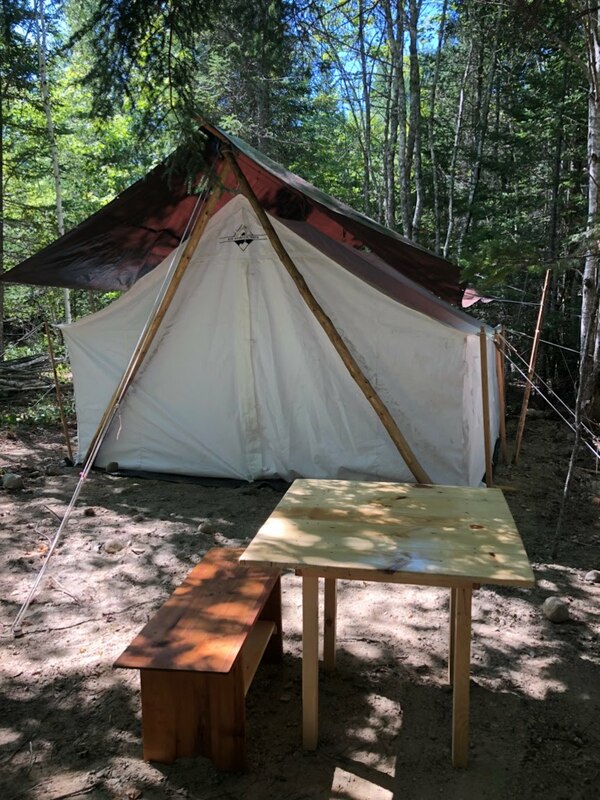 You can set the wall tent up a few different ways in the backcountry without a frame. Run a rope through the eave openings and tie the ends to two trees. Run a rope through the eave openings and build two “A” frames on each end to run the rope over and stake down. Run a tree through the eve openings and rest on the two “A” frames. The center strap in the eve opening may need to be removed to make this options work. We recommend a tent fly. This will help protect your investment from embers as well as give you an additional layer of protection from the elements. Embers will burn a hole in any wall tent no matter the material or fire treatment. We sell a lightweight, waterproof fly made to fit your tent, but you can also use a standard tarp. A two-foot hole will need to be cut out around the stove pipe if you use a tarp. Our tents are treated to make them waterproof, but all fabric can and will leak eventually. Installing a floor is easy with the extra angle pieces we provide. We sell a heavy duty rubberized PVC floor that is made to fit your tent. They tie into place. You can also purchase a tarp that is slightly larger then the tent size. Tuck the tarp under the wall poles or under the base poles and pull the material up between the wall poles and the canvas. The ground cloth is then tucked under the tarp and poles.